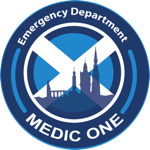 Edinburgh Emergency Medicine - Consultant posts now advertised. Join the #EDvolution! Consultant posts now advertised. Join the #EDvolution! We are looking for 2 enthusiastic team players to join the Edinburgh EM Consultant team. This post is based at St John's Hospital, Livingston with the opportunity for cross-site working at either Royal Infirmary of Edinburgh or Royal Hospital for Sick Children, Edinburgh. This post is also based at St John's Hospital with sessions at the Royal Hospital for Sick Children, Edinburgh. Our service and ethos is well described on our website. Please contact us if we can give you more details. Join the EDvolution!